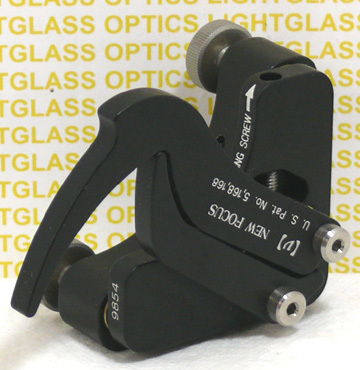 The New Focus 9854 Tilting Opti-Claw mount offers a fast and easy way to allow you to remove, replace and re-center your optics quickly. It is ideal for mounting lenses, mirrors, filters, beamsplitters and other similar optical components. The diameter of these optics can measure from 0.10" up to 2.00" and the claws have vee grooves to hold the edges of your lenses and filters. Once the optic is in place, the claws can be securely locked with a setscrew. The New Focus 9854 also has 3 actuators to tip/tilt positioning of your optic.